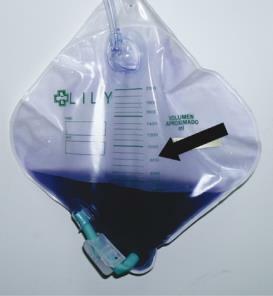 Purple Urine bag Syndrome, or PUBS, occurs when urinary catheters and bags become a purple color. The urine can be normal yellow color or it can be purple, too. The cause of the purple color is not known – there is no scientific evidence to explain why this happens. Research so far does not show it is related to the type or brand of urine bags or catheters used – it can occur in all catheters. However, there are many theories about why it occurs. Some people believe different bacteria in urine create the purple color. It has also been reported that a slowed down gut is enough to increase the chances of developing PUBS. Others believe it is caused by a change in where tryptophan, an amino acid found in many foods, is broken down in the body. Normally, tryptophan is broken down in the small intestines and any extra moves to the large intestine. With constipation or a slowed down gut (commonly found in people with spinal cord injury), tryptophan stays in the system longer. Once in the large intestine it is believed that bacteria reacts with tryptophan to create red and blue dyes – when red and blue are mixed they make purple! The degree of purple depends on the unique concentration of red dye and blue dye produced – sometimes it is more blue, sometimes more red, and sometimes it is a shade of purple. People who use indwelling urinary catheters are at risk for developing Purple Urine Bag Syndrome. The longer a catheter or a urine bag is in place, the darker the purple color may become. Other factors that might increase the chance of developing Purple Urine Bag Syndrome include constipation and dehydration. The best way to prevent a UTI is to drink lots of fluids. Drinking at least 2000 to 3000 ml of water every day is important. This is equivalent to about 8 to 12 eight-ounce glasses or about 3 quarts of water every day. It is best to avoid beverages with sugar, caffeine, and alcohol. These drinks may increase bladder irritation and contribute to UTIs. Some people believe that cranberry pills can help reduce UTIs by changing the chemistry of the urine and stop bacteria from clinging to the bladder wall. Clinical research on the effectiveness of cranberry is mixed – some studies support the use of cranberry and some studies do not. However, many people report a deceased frequency of UTIs when using cranberry pills. If you decide to take cranberry to help reduce the number of UTIs, we recommend taking the cranberry pill and not cranberry juice. Cranberry juice contains a lot of sugar and calories. Blended juices (crangrape, cran-apple, etc.) do not offer enough cranberry ingredients to have any benefit. Sometimes your doctor will recommend vitamin C, which can make your bladder more acidic, which can help prevent or treat your UTI. Talk with your doctor about any medications or herbal supplements before taking them. If you have an indwelling catheter, in general, it should be changed on a monthly basis. It may need to be changed more often if you get frequent UTIs or produce a lot of sediment or crystals in your urine. Talk with your doctor about the schedule that is right for you. Keeping the catheter and insertion site clean is also very important. If you have an indwelling catheter, clean the catheter and the insertion site in the morning and at night with soap and water. A healthy functioning bowel program is the combination of many factors. The primary goal of bowel management is to promote regular emptying of the bowels for cleansing and health. In addition to establishing a consistent bowel program, attention to diet and fluid intake, activity, and medications all play a part in maintaining bowel health. Take the same medications daily as prescribed by your doctor. Medications you take for your bowel program need to be taken at the same time and in the same dose daily – your body does not like surprises! Establish a routine for the bowel program. If you do digital stimulation or use a suppository – do this every day and in the same order. Eat a diet high in fiber – 20 to 25 grams of fiber daily is recommended but no more than 35 grams of fiber per day. Drink water – Drinking at least 2000 to 3000 ml of water every day is important. This is equivalent to about 8 to 12 eight-ounce glasses or about 3 quarts of water every day. Maintain a regular diet - avoid caffeine, alcohol, and foods that upset your stomach. Establish a regular exercise routine and stick with it – activity plays a vital role in moving food through the GI tract. We humans are more than 60% water. We begin to get dehydrated and our performance drops off with just so much as a 2% water loss. What can cause water loss? It doesn’t take much. It can happen to an athlete who is competing, to someone who is in bed with the flu or diarrhea, in the very hot weather, or even to someone who just doesn’t drink enough. Dehydration has been associated with Purple Bag Syndrome. When you are dehydrated, your kidneys won’t be able to function; waste products will back up in your body, making you feel generally crummy. We have said it before and we will say it again - Drinking at least 2000 to 3000 ml of water every day is important. This is equivalent to about 8 to 12 eight-ounce glasses or about 3 quarts of water every day. You may think, “That’s A LOT of water,” and you’re right! But, there are great benefits to constantly flushing out your kidneys and bladder including prevention of urinary tract infections, prevention of constipation, and prevention of dehydration – three factors commonly found with Purple Bag Syndrome. If your urinary catheter, urine bag, or urine turns a blue or purple color, see your doctor. Since the cause of Purple Urine Bag Syndrome is unknown, getting a thorough assessment by your doctor will help find a solution and treatment.